The maned sloth (Bradypus torquatus), also known as the ai (/ˈɑːi/), is a three-toed sloth that lives only in Brazil. It is one of four species of three-toed sloth. The maned sloth is now found only in the Atlantic coastal rainforest of southeastern Brazil, although it was once also found further north. It has been identified predominantly from evergreen forests, although, being able to eat a wide range of leaves, it can also inhabit semi-deciduous and secondary forest. It is typically found in hot, humid climates without any dry season, and with annual rainfall of at least 120 centimetres (47 in). There are no recognised subspecies. Maned sloths have a pale brown to gray pelage. Long outer hair covers a short, dense, black and white underfur. The coarse outer coat is usually inhabited by algae, mites, ticks, beetles, and moths. The maned sloth's small head features fur-covered pinnae and anterior oriented eyes that are usually covered by a mask of black hair. The sides of the maned sloth's face and neck feature long hair covering the short hair of the sloth's snout. Facial vibrissae on the maned sloth are sparse. The maned sloth earns its name from a mane of black hair running down its neck and over its shoulders. The mane is usually larger and darker in males than in females, and in the latter, may be reduced to a pair of long tufts. Other than the mane, the fur is relatively uniform in color, and, in particular, the males lack the patch of bright fur found on the back of other, closely related, sloths. Adult males have a total head-body length of 55 to 72 centimetres (22 to 28 in), with a tail about 5 centimetres (2.0 in) long and a weight of 4.0 to 7.5 kilograms (8.8 to 16.5 lb). Females are generally larger, measuring 55 to 75 centimetres (22 to 30 in), and weighing 4.5 to 10.1 kilograms (9.9 to 22.3 lb). Like all other sloths, the maned sloth has very little muscle mass in comparison to other mammals its size. This reduced muscle mass allows it to hang from thin branches. Maned sloths are solitary diurnal animals, spending from 60–80% of their day asleep, with the rest more or less equally divided between feeding and travelling. Sloths sleep in crotches of trees or by dangling from branches by their legs and tucking their head in between their forelegs. Maned sloths are folivores, and feed exclusively on tree and liana leaves, especially Cecropia. Although individual animals seem to prefer leaves from particular species of tree, the species as a whole is able to adapt to a wide range of tree types. Younger leaves are preferred to older, and tree leaves are preferred to liana leaves. Individual maned sloths have reported to travel over a home range of 0.5 to 6 hectares (1.2 to 14.8 acres), with estimated population densities of 0.1 to 1.25 per hectare (0.040 to 0.506/acre). Maned sloths rarely descend from the trees because, when on a level surface, they are unable to stand and walk, only being able to drag themselves along with their front legs and claws. They travel to the ground only to defecate or to move between trees when they cannot do so through the branches. The sloth's main defenses are to stay still and to lash out with its formidable claws. It can swim well. Although some reports indicate that maned sloths are able to breed year round, others have observed that the majority of births occur between February and April. The mother gives birth to a single young, which initially weighs around 300 grams (11 oz) and lacks the distinctive mane found on adults. The young begin to take solid food at two weeks, and are fully weaned by two to four months of age. The young leave the mother at between nine and eleven months of age. Although their lifespan has not been studied in detail, they have been reported to live for at least twelve years. 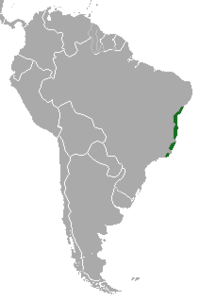 In 1955, the maned sloth occurred only in Bahia, Espírito Santo and Rio de Janeiro in eastern Brazil, in the Bahia coastal forests. It has declined since then as these forests have dwindled. The major threat to the maned sloth is the loss of its forest habitat as a result of lumber extraction, charcoal production, and clearance for plantations and cattle pastures. Excessive hunting is also a threat. ^ Gardner, A. (2005). Wilson, D.E. ; Reeder, D.M. (eds.). Mammal Species of the World: A Taxonomic and Geographic Reference (3rd ed.). Johns Hopkins University Press. ISBN 978-0-8018-8221-0. OCLC 62265494. ^ a b Chiarello, A. & Moraes-Barros, N. (2014). "Bradypus torquatus". The IUCN Red List of Threatened Species. IUCN. 2014: e.T3036A47436575. doi:10.2305/IUCN.UK.2014-1.RLTS.T3036A47436575.en. Retrieved 4 January 2018. ^ a b c d Hayssen, V. (2009). "Bradypus torquatus (Pilosa: Bradypodidae)". Mammalian Species. 829: 1–5. doi:10.1644/829.1. ^ Chiarello, A.G. (1998). "Activity budgets and ranging patterns of the Atlantic forest maned sloth". Journal of Zoology. 246 (1): 1–10. doi:10.1111/j.1469-7998.1998.tb00126.x. ^ Stewart, Melissa (2004). "At the Zoo: Slow and Steady Sloths". Zoogoer. Friends of the National Zoo. Archived from the original on 7 June 2011. Retrieved 7 June 2010. ^ Adriano, Chiarello (September 1998). "Diet of the Atlantic forest maned sloth Bradypus torquatus". Journal of Zoology. 246 (1): 10. doi:10.1111/j.1469-7998.1998.tb00127.x. ^ Pinder, L. (1993). "Body measurements, karyotype, and birth frequencies of maned sloth (Bradypus torquatus)". Mammalia. 57 (1): 43–48. doi:10.1515/mamm.1993.57.1.43. ^ Dias, B.B. ; et al. (2009). "First observation on mating and reproductive seasonality in maned sloths Bradypus torquatus (Pilosa: Bradypodidae)". Journal of Ethology. 27 (1): 97–103. doi:10.1007/s10164-008-0089-9. ^ a b Lara-Ruiz, P. & Chiarello, A.G. (2005). "Life-history traits and sexual dimorphism of the Atlantic forest maned sloth Bradypus torquatus (Xenarthra: Bradypodidae)" (PDF). Journal of Zoology. 267 (1): 63–73. doi:10.1017/S0952836905007259. This page was last edited on 17 January 2019, at 08:10 (UTC).